Situated on the southern coast of the Persian Gulf is the scenic, historic city of Sharjah. It is the third-largest destination of the United Arab Emirates, with more than 1.4 million residents. Sharjah offers you its historic old town and numerous beautiful landmarks and engaging attractions. Top attractions include Sharjah Arts Museum and Al Majaz Waterfront. Prepare to discover more of the United Arab Emirates’ wealth of history and culture, because cheap flights to Sharjah are now available for a limited time! Sharjah is the home of Sharjah International Airport (SHJ), which is a 10-minute drive from the centre of the city. A wealth of shopping malls and markets are available in Sharjah. You’ll be spending hours at these locations, shopping for various products, such as fashion, cosmetics and electronics, and sitting down to enjoy scrumptious meals at the food court. Sharjah is the cultural capital of the United Arab Emirates. Enjoy tours through a number of venues, including historic sites like Sharjah Archaeology Museum and the Maritime Museum, as well as arts venues like the Sharjah Art Museum. For a taste of the entertainment in Sharjah, visit Al Qasba, the city’s leading night-time attraction. 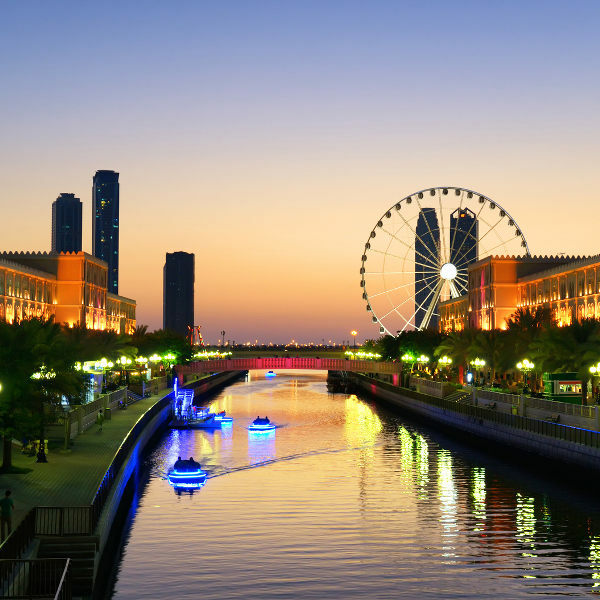 This waterfront quarter includes a variety of cafés and restaurants, but its biggest attraction is the towering observation wheel, the Eye of the Emirates. The most popular time to visit Sharjah is during the winter months (October to April), due to cooler temperatures and dryer conditions, which ensure a more comfortable holiday experience. If you choose to visit during this time, be prepared to book you flights and accommodation well in advance and to pay higher rates. Since the United Arab Emirates is an Islamic state, you will be expected to respect the local customs and traditions. Make sure to find out when Ramadan takes place (usually between May and June), as there will be restrictions on eating, drinking and other activities. The best time to visit Sharjah for cheap flights and affordable accommodation is during the summer months (May to September). Beware of the temperatures, however, as they can reach close to 40°C; pack plenty of sunscreen, hats and sunglasses. Take care to respect the local laws to dress modestly (no exposed knees, backs and stomachs). Get ready to immerse yourself into the incredible culture and history of the United Arab Emirates with a visit to the city of Sharjah, the capital of the Emirate of Sharjah, one of seven in the country. Despite not having the glittering appeal of Dubai, this coastal city is rich in its own way, with its high status regarding the Arab culture. In 1998, UNESCO declared Sharjah the Cultural Capital of the Arab World. This recognition was reaffirmed in 2014, when this destination became the Capital of Islamic Culture. Get past the bustling outskirts of the town to discover its historic centre. Set aside a few hours to explore the heritage and arts areas, as well as the souqs. 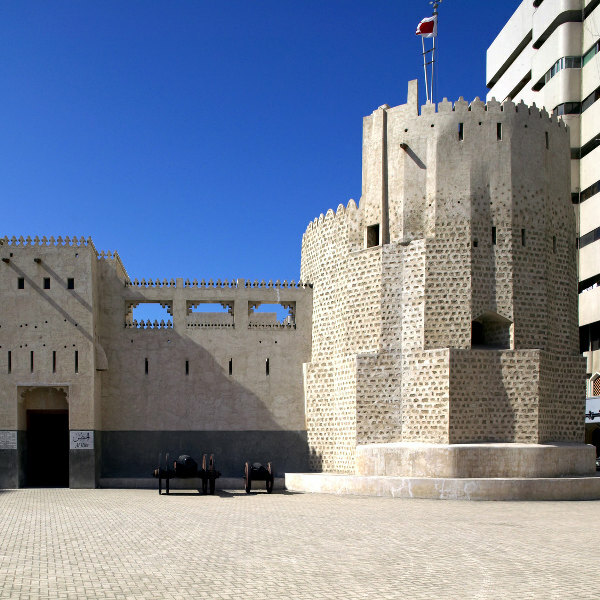 Some major historic sites include Al Hisn Sharjah, Sharjah Heritage Museum, Al Mahattah Fort and Rolla Square. 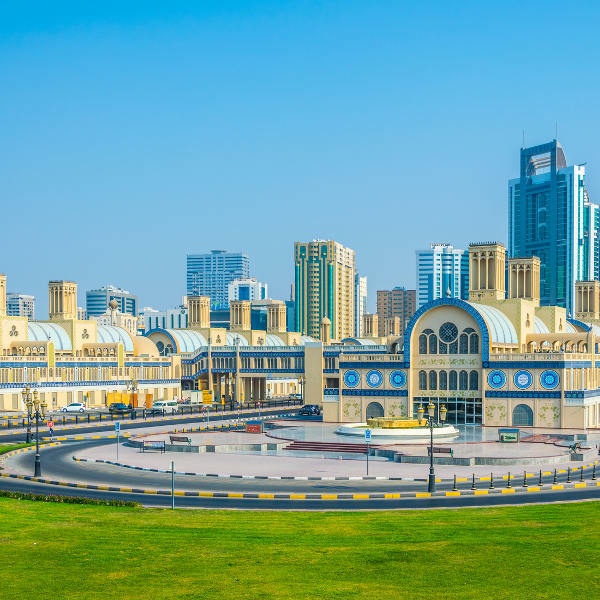 For those who love watching animals, enjoying nature and admiring gorgeous scenery, there is the Sharjah National Park, the Sharjah Aquarium and Al Noor Island (which includes a butterfly house, home to approximately 500 different butterfly species!). A further exploration of Sharjah will reveal more of this destination’s identity as a shopaholic’s paradise! You will find a wonderful selection of shopping malls and markets, such as Sharjah City Centre, Sahara Centre, Al Shaab Village and Central Market. Each of these shopping venues offer you a range of products, including clothing, cosmetics, electronics and traditional Arabic products. Many of these locations include food courts filled with a variety of enticing restaurants and cafés. Some additionally offer visitors entertainment in the form of games and activities, as well as cinemas. A holiday in Sharjah will ensure you have a satisfying holiday experience in the United Arab Emirates! Compare several airlines and book your cheap flights to Sharjah online at Travelstart! Sharjah enjoys a high level of safety. Female travellers, however, may find themselves stared at in certain parts of the city, so it’s recommended to bring a male relative or friend along, to ensure their safety. Should you pay with an overseas credit card, make sure to inform the merchant you will not be using dynamic currency conversion (which would mean you would pay several percent more than the actual cost). Some merchants may not inform you of this, so you will have to intervene to avoid being overcharged.